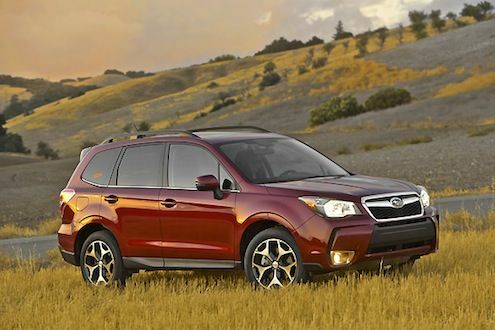 The all-new 2014 Subaru Forester continues its global launch and made its Canadian premiere in Montreal. Subaru is looking for the all-new completely redesigned 2014 Forester to increase global sales as it makes its launch this year. North America will continue to be a large market for the Japanese automaker. The Canadians got their fist glimpse of the new crossover when it made its Canadian premiere this week at the Le Salon International de l'auto in Montreal. The new Forester was unveiled with its new bold exterior design, roomier interior along with improved performance and impressive fuel economy. The Canadian models will feature Subaru’s new 2.0-litre direct injection twin-scroll turbocharged Boxer engine producing 250 horsepower and will be introduced on Forester 2.0XT models. The naturally aspirated version will continue with the 2.5-litre horizontally opposed Subaru Boxer engine producing 170 horsepower. Standard Subaru symmetrical full-time All-Wheel Drive will give Canadians sure-footed driving in any weather. The new Forester will get first-in-class fuel mileage with the 2.5i model getting a manufacture-estimated fuel economy ratings of 6.2 litres per 100 kilometres on the highway when equipped with the Lineartronic CVT (continuously variable transmission). The new 2014 Forester will come in the 2.5i entry level as well as a Convenience Package with a PZEV option, a Touring Package, and a Limited Package with an EyeSight option. Two transmission choices will be a available, a new six-speed manual transmission or Subaru's fuel-saving Lineartronic CVT. The sporty new twin-scroll turbocharged Forester 2.0XT will feature six-speed and eight-speed manual shift modes with steering-wheel paddle shifters as standard equipment. All Forester CVT models will gain a new X-Mode and Hill Descent Control feature that works in conjunction with Subaru symmetrical full-time All-Wheel Drive. In conjunction with the Boxer engine and brakes, it will provide extra control on slippery Canadian roads. New convenience features in the fourth-generation Forester make the crossover much more upscale than the outgoing model. All but the base 2.5i model come with a standard rear-view camera and colour multi-function display. New features will include a power rear liftgate with memory function, touchscreen navigation and an eight-speaker, 440-watt harman/kardon audio system as well as preventative safety technology in the EyeSight driver-assistance system. Canadians will appreciate the new EyeSight safety system on the 2014 Forester that includes Pre-Collision Braking System, Pre-Collision Brake Assist, Pre-Collision Throttle Management, Adaptive Cruise Control, Lane Sway and Departure Warning and Lead Vehicle Start Alert. The new Forester is longer and wider than the outgoing model. It measures 2,640 millimetres long and vehicle length and width have increased by 35 millimetres and 15 millimetres, respectively. This translates to notable gains in roominess, particularly in the rear seat where legroom is now 965 millimetres. Higher seat hip points, a lower centre tunnel and shorter front console also provide greater legroom and comfort for the centre rear-seat passenger. Maximum rear cargo area room with the 60/40-split rear seatbacks lowered is now 2,115 litres, which is among the best in its class. The newly redesigned 2014 Subaru Forester is set to deliver Canadians even more value, with the well-equipped entry model starting from $25,995, and the turbocharged Forester 2.0XT starting from $32,495. The 2014 Forester is set to arrive in Canadian dealerships in early spring.